Editors: Erin Byrne writes travel articles and essays, short stories, poems, and screenplays which are published in a wide variety of international publications, literary journals and anthologies. Her work has won numerous awards, including 2013 and 2012 Travelers’ Tales Grand Prize Solas Awards for Best Travel Story of the Year. Erin teaches the workshop, “Deep Travel,” with writer Christina Ammon. She is the writer of The Storykeeper, an award-winning film currently being shown at festivals worldwide. She is currently working on Wings from Victory, a collection of her travel essays, and the novel The Storykeeper of Paris. www.e-byrne.com. 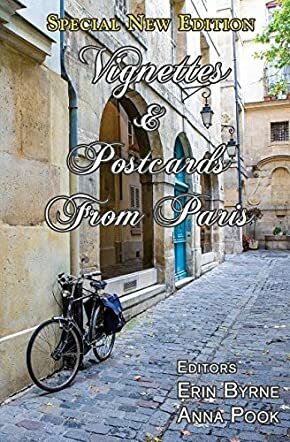 "Vignettes & Postcards" edited by Erin Byrne and Anna Pook contains a collection of humorous, lyrical, and philosophical short stories that I found utterly engaging. The editors demonstrate keen literary instincts in anthologizing these fine pieces of short fiction. Anna Pook has led writer's workshops for several years from an upstairs room at the Paris bookstore Shakespeare and Company and Erin Byrne is occasional guest instructor. These stories come out of Erin's workshop, Leaping Into the Void. The stories selected represent the work of the formidable workshop participants. Readers like me who have visited Paris will find themselves filled with nostalgia by the sights and sounds of Paris so imaginatively realized, especially in stories such as Claire Fallou’s work. Kate Bujanovic’s character, Anna, so full of complexity, seemed to woo me into the story as she reveals her disappointment over love and how she finds solace in a soulful Paris bookshop (redolent of Shakespeare and Company) that appears to be brimming with the life she desperately seeks. I appreciated the finely etched details and the way the author created a vivid setting. The editors enhanced the text by including original photographs that serve as illustrations for some of the stories and thoughtful epigraphs. All the authors displayed a rare literary sensibility coupled with excellent craft that make the stories worth reading over and over again. Each time I found something fresh and enlightening. Once I started reading the collection of stories by a diverse group of authors, I found it hard to put it down. It is surprising how close the editors appear to be to the project as if it were a labor of love.